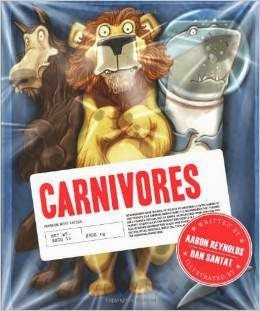 Carnivores by Aaron Reynolds and Dan Santat. Lion, Great White Shark and Wolf are tired of their bad rap as villains of the food chain...but old menus die hard. Wicked and hilarious. Recommended by The PlanetEsme Plan. Link for information; please support your local independent bookseller.